This may be a facepalm moment. So I know the rule of thumb to power inject after 50 pixels with 5v. First time with 5v pixels or power injection. Well, I was short on power supplies and so after research, getting people's opinions/feedback here, checking with online calculator and SOME testing...It looked like I may be able to get away without power injection under 70 pixels provided a few factors ideal factors and the assumption that I would likely have to turn down the intensity. Both for people's eyesight AND to reduce power consumption. Well my initial tests with 70 pixels and no power injection seemed to go pretty damn smoothly. All the test patterns worked great with no visible color change or dimming. The exception to that was the all white 100% test pattern, where the last 15-20 pixels were flashing. Since I saw no other symptoms, and I wasn't going to run 100% anyways, let alone 100% white, seemed like it would be fine. Fast forward to the day before the show. I have my mega tree setup as 8 strings of 70, folded back to zig zag at 35. so 16 legs. This is the first time I've fully patched everything and run it from vixen like I will be. In effect, this would be the finished show product. I even reduced intensity in the e682 to 50% for each output, thinking that would be more than enough, if not overkill. Except, even then, with all white set to on through vixen and only 50% power at the controller source, the same damn issue is back with the flickering. This is freakish, because there's no dropoff or transition, it's just perfect one pixel, the next up to the end is flashing and flickering. And cutting the intensity/power by 50% didn't seem to have any effect at all. So then, to test, I start also lowering the intensity of the effect inside vixen, and finally do get it to stop flickering and stay uniformly lit...except it's incredibly dim. I have to turn it so far down to level it off it's problematic. This also isn't how i've seen pixels reacts from power drop issues on various videos. You usually get a section that's perfect and then problems begin at a certain point. So facepalm on that smart idea of mine 22 hrs until advertised showtime.... Any ideas? like I said, 8 strings of 70, using 8 outputs on the controller E682, 16 legs. Any options that DON'T involve having to somehow get a power supply AND wire up another 16 wires in less than a day? Not that it would be fun but there is nothing saying you have to have power at the top or bottom of those strips. If it was me I would inject power partway up those strands at a spot that’s convenient for you. 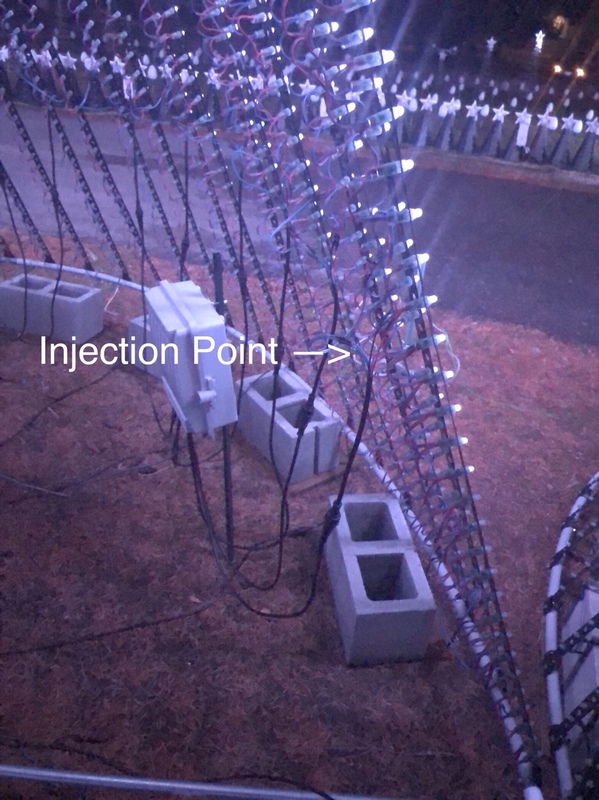 I have a tree that’s 120 pixels (12v) on each strip instead of risking issues at the end of the strip I injected power at the split between the first 20 from the bottom and the last 100. It’s not as clean of a wiring method but I don’t have power issues that way. That is a rough one due to time constraints. You do not necessarily need a second power supply to do power injection. You can use the same one. Just run larger wires, like 14 awg, from the power supply to the power injection point. I think that would be the simplest and quickest solution. If you voltage is so low that you have to turn down the intensity to a level that is barely viewable then I do not think any software option is going to help. What gauge are your power wires and how far from the power supply to the connection to the pixel string? This is a power problem but more likely due to the voltage drop between the power supply and the beginning of the pixel string. Also what gauge is your pixel string wire? My tree is 5v I have 100 pixels on one output 30% intensity no problems with a 8 ft 18ga lead to first pixel. Just lower the brightness, all my controllers are set at 20% to 30%.